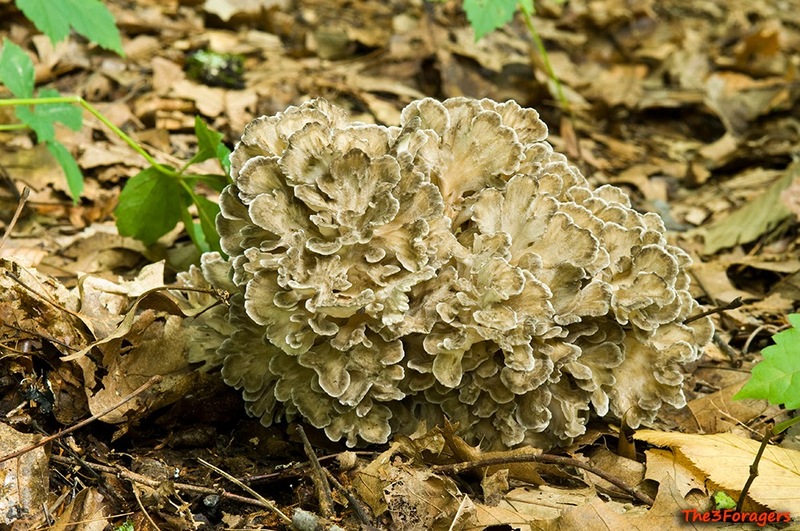 We have been finding large amounts of hen of the woods (Grifola frondosa) this season, staring with the first find at the end of August. After an initial early flush, they started fruiting heavily in late September, and we have found more than 30 hens so far this season. We preserve our hens mostly by dehydrating the fronds to use later for soup stock, and by freezing the cores and more fronds to chop up for burgers. Robert also made lots of sausage with hens this year, using the same technique for making vegetarian sausage made from sulfur shelf mushrooms. We needed to find something else to do with the pounds of mushrooms in the fridge, so we made some wonderful jerky. We found that this works best with slices from the core, or with very large fronds, since the pieces shrink up quite a bit in the dehydrator. We are using our Excalibur dehydrator, but an oven set on the lowest temperature will work, although the drying times will vary. We store our dried jerky in covered glass jars, but if we had a vacuum sealer, that would work well too. It doesn't last long around here, and it disappears even faster if we bring it out to a potluck event. This recipe makes a sweet/salty/spicy jerky, and the flavors can be changed to suit your tastes. In the recipe, is the apple cider or apple cider vinegar? I have never seen a jerky recipe without vinegar. We used sweet apple cider from the local orchard. I have no idea how to make meat jerky, we are mostly vegetarians. I just made a batch of this following the recipe exactly. OMG. It is incredibly good. It came out perfectly and the flavor is so great and so well-balanced. Thanks, Karen, for this awesome new way to handle maitakes! This is going to become a standard for me. Have you posted the vegetarian mushroom sausage technique anywhere? I've been looking but cannot find it. :) THANKS for all the great ideas. which third of you guys is a veggie? Robert and Gillian are lacto-ovo vegetarians, but they will eat fish when we vacation on a tropical island. I am an omnivore. I believe all of our recipes are lacto-ovo vegetarian at least, with a few vegan ones thrown in. 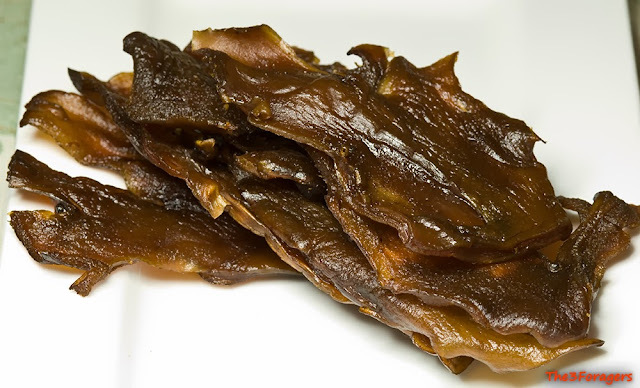 I just ran across this recipe and was curious as to if you want the "jerky" slightly pliable or totally dehydrated where it breaks upon bending. We were lucky enough to find several pounds of hens, and really want to give this recipe a try. We dry it but it is still slightly pliable. I would not recommend using cider vinegar at all, otherwise the jerky will taste like vinegar. Just use some apple juice in place of the cider. Thanks for the great idea. I have a batch going right now with a similar recipe of ingredients on hand. I wonder if you use the water you have boiled the hens in for a broth? Yes, the water used to boil the pieces of hen can be saved and used as a broth. I like to save the liquid and use it to boil a second bunch of hen pieces, then the broth is stronger. Thanks so much for this recipe! The maitake jerky far surpassed my expectations. Hello. Can you make Oyster Jerky? Have you ever tried? PS I made the maitake jerky and loved it. Thanks! 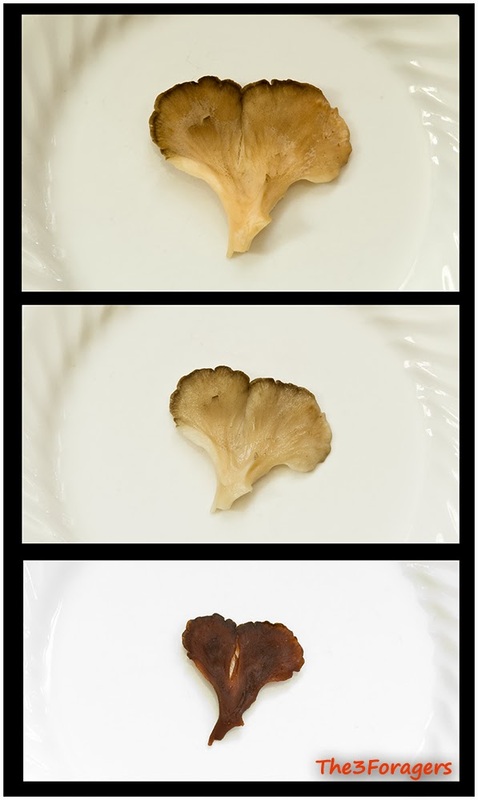 We originally tested the recipe with king oysters, Pleurotus eryngii, but hose are very thick, hearty mushrooms. I don't see why the idea wouldn't work with regular oysters, but they are mostly gills and might make smaller bits of jerky. Saw someone try this with Armillaria caps and said they turned out really small and it wasn't worth it. Still, given my love of the way the Maitake turned out (Which incidentally seems to taste a lot like the original beef jerky made by Jack Links), I do plan to try this with Oysters as well. Instant fan, hope to find more stunning recipes on your blog as well. Thank you for sharing! I make this with Armillaria all of the time, it's a great way to use caps and stems and all, even on old ones. There are some small pieces and some big ones as well. I've been using this recipe for a few years and it never fails to impress. Just started marinating the first batch of the season, looking to be a great year for NWCT. What about Chicken of the Woods? Can you substitute? Would it be ok to cook the hens in a steamer for 10 minutes? Seems to me it would be easier to dry them out after. Laetiporus chicken mushrooms are usually too tough and thick to use for this jerky. You don't need to dry off the boiled mushroom before adding it to the marinade, just strain briefly.